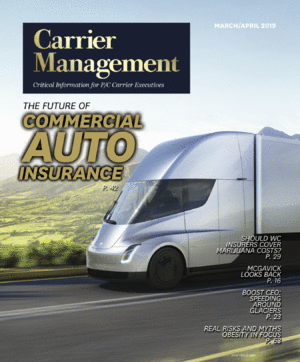 Expect U.S. commercial auto insurance to improve somewhat in 2019 even as A.M. Best maintains its negative outlook for the sector over the next year. That split forecast stems from commercial auto insurers having taken steps to address their most problematic exposures, though previous years’ loss reserves are still adversely affecting current calendar results, A.M. Best said. Those actions, in part, have included multiple years of rate increases, according to the report. The U.S. commercial auto combined ratio was 112.9 through Q3 2018, A.M. Best said, compared to 111 in 2017 and 110.4 in 2015. A.M. Best noted that the sector hasn’t had a combined ratio under 100 since 2010, when it hit 97.9. With these factors in mind, A.M. Best predicts more problems in 2019. The ratings agency sees U.S. commercial auto insurance facing more deterioration in its net combined ratio through 2018 (data is available through Q3), which should lead to companies pushing for more rating increases in 2019. The added rate hikes should “bring the line closer to rate adequacy amid the ongoing escalation in current-year loss costs,” A.M. Best said. Even with rate hikes, A.M. Best sees U.S. commercial auto as being hammered by a number of continued factors, including more vehicles traveling more miles boosting accident frequency, the poor shape of U.S. roadways and smartphone usage while driving.